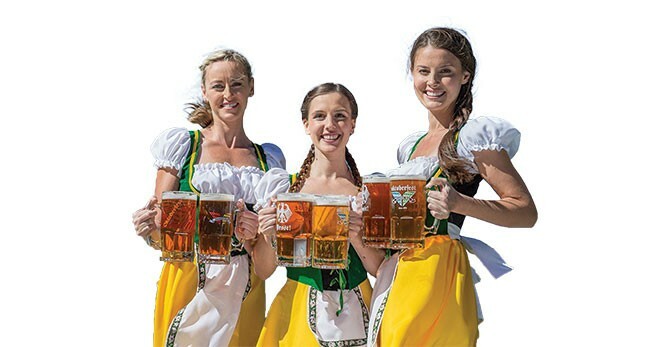 Although the annual number of attendees differs by a couple degrees of magnitude—some 6 million-plus visitors in Munich as opposed to 60,000 here—one thing Snowbird Resort's 43rd annual Oktoberfest has going for it is that there's still one last weekend to enjoy the Oktoberfest fun in Utah, whereas the 2015 Munich Oktoberfest in Germany ended Oct. 4. So dust off your lederhosen for one last Bavarian-style fling. Oktoberfest ends Sunday, Oct. 11, at 6:30 p.m. Unlike Oktoberfest in Munich, Snowbird's is about more than just beers and brats (not that there's anything wrong with that). Visitors to Snowbird during Oktoberfest will discover a dizzying array of local and regional artists displaying handmade arts and crafts at "Der Marktplatz," where you can shop until you drop for a winter sweater, piece of artwork for the living room or one-of-a-kind article of jewelry. There are kids' activities galore, from face-painting and bounce houses to the Mountain Flyer zip-line, bungee trampoline, carnival games, caricature drawings, climbing wall, alpine slide, mountain coaster, vertical drop, mining for gold, bike and scooter rentals, fishing at Austin Pond and a ropes course. There's also hiking, mountain biking, Snowbird Aerial Tram rides, the Peruvian chairlift and tunnel, as well as live music and entertainment for the entire family. You won't want to miss the Alphorns of Salzburger Echo, which you can enjoy while taking an Aerial Tram ride. They perform on Hidden Peak (bring a sweater or jacket!) each day during Oktoberfest at 3:15 p.m. Other entertainers for Oktoberfest 2015 include Shan the Juggler and Dale Myrberg, the Yo-Yo Man. Inside the Oktoberfest Halle, you'll also be treated to the sounds and sights of traditional German Oktoberfest by the likes of the Polkatones, Alpenfolk, Alpine Express, B&B All Stars and Europa. There's also live music outside on the Chickadee Music Stage. You may want to meet the Bürgermeister (Mayor of Oktoberfest) while you're there. Part of the Bürgermeister's job is to help promote Bavarian culture and to help explain Oktoberfest's 205-year history. Rick Schwemmer is in his fifth year serving as Bürgermeister; his father Walter was Bürgermeister for 10 years. The original Bürgermeister for Snowbird's Oktoberfest was Horst Young, who held the position for 26 years. Of course, there will be brats and beer. In recent years at Snowbird's Oktoberfest, visitors devoured some 6,000 pounds of bratwurst and weisswurst, 4,500 pounds of chicken and 2,000 Granny Smith apples in the form of strudel. Of course, much beer will be consumed as well, in addition to wine at Biergarten locations throughout the Oktoberfest grounds. And this year, Oktoberfest is appropriately featuring a large selection of German beers. You can even purchase a 22-ounce refillable glass souvenir stein like they serve beers in at the München Biergarten in Germany. Anyone looking for a peaceful dinner after celebrating Oktoberfest should head up to the 10th floor of the Cliff Lodge to the Aerie restaurant, with its spectacular mountain views and excellent cuisine from executive chef Ken Ohlinger. His eclectic menu covers the bases, from poke salad and sushi rolls, to elk meatloaf, lobster macaroni & cheese, grilled pork loin with braised pork cheek, pan-seared trout, burgers, sandwiches and more. Or, find South of the Border flavors at Cliff Lodge's El Chanate, where chef Carlos Perez cooks up tantalizing Mexican dishes like pollo & mole, shrimp taquitos, sopes de carne asada and steak filet with cactus, to name a few. I hope you enjoy this last gasp of Oktoberfest at Snowbird. Prost!